England boss Roy Hodgson believes "African teams have a stronger chance than European teams" of winning next year's World Cup in Brazil. While Hodgson's side have booked their place at the finals, African teams will play their final play-off ties later this month to decide who qualifies. Whichever five African sides make it, Hodgson feels they will have an advantage because of the climate. "And there are many excellent African players out there now," he added. "They play in the top European leagues and that makes the African nations very strong. 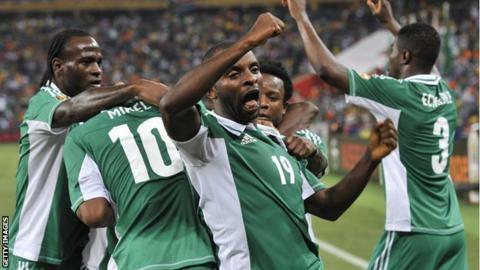 "Nigeria have traditionally been one of the strongest, with some famous names in their team." Hodgson will attend Nigeria's friendly against Italy at Craven Cottage next Monday, on the eve of England's game against Germany. And he expects to see a quality match between the current African champions, who are on the verge of qualifying for Brazil after a 2-1 win over Ethiopia in their play-off first leg, and the four-time world champions. "Whoever is at the game on Monday night will see two very good teams and it will be an exciting outcome," Hodgson said. "Who knows, we may even see a little pointer for how things will go in Brazil."